The NT Parks and Wildlife Commission is clearly spending a great deal more time controlling people than introduced grasses which are choking the Trephina River. 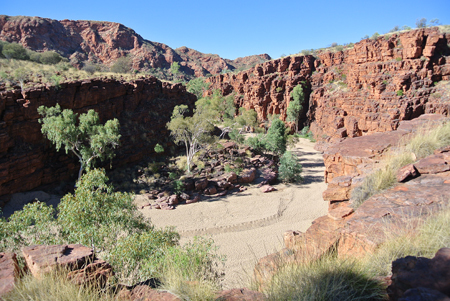 It flows through the gorge that is one of the jewels in our tourism crown. 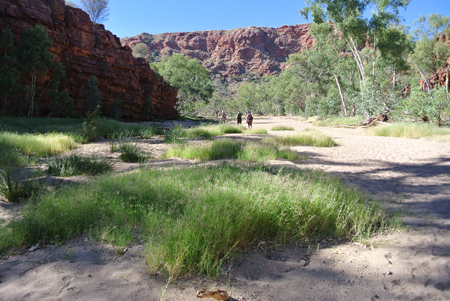 Couch and buffel grasses are lining both banks of the gorge, end to end, and beyond. 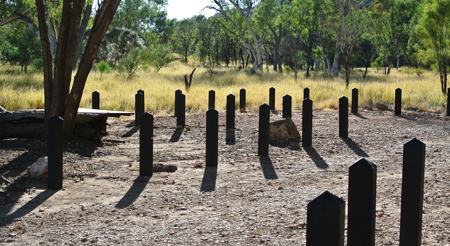 At the same time the Trephina camp ground, about 70 km east of Alice Springs, now features hundreds of ghastly black plastic bollards that tell visitors where they can go and where they cannot. The commission, during all of last year, spent a mere 165 man-hours on the control of the grasses – the equivalent of one person working one month. And most of that effort focused on protecting the rangers’ houses, the access road and “all visitor hubs, around assets and infrastructure” according to a written statement from the commission. The natural assets of the place, which is what people driving our tourism industry come to see, seem to be of lesser importance. Where? When? How much money will be spent on it? These are questions to which we could not get an answer. The Alice Springs News Online was not permitted to interview the author of the statement, Chris Day, Director of Central Australian Parks, and follow-up questions we put in writing were ignored. Absurdly, Mr Day has been known to the writer of this report for decades and, over the years, has given several interviews to the News. We first raised the issues with the Government three weeks ago. 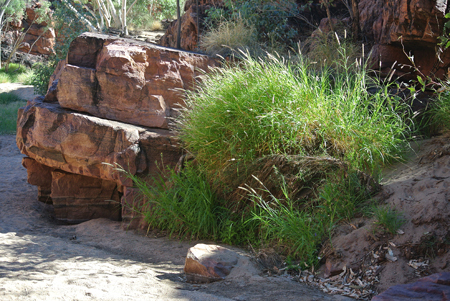 Buffel (at right), an introduced grass, doing well in the Trephina River. South Australia has declared war on buffel but in the Territory it’s not even declared a weed. Successive governments have succumbed to the pressure of pastoralists although vast tracts of national parks – far greater money spinners than cattle – are under threat of being taken over by the plant, introduced from South Africa to suppress dust. The CSIRO played a role in its propagation. Couch spreading into the sandy creekbed. The native passionfruit (above) is threatened by the spread buffel and couch. This one is still flourishing in Trephina Gorge, but the plants once widely seen along the banks of the Todd in town have all but disappeared. 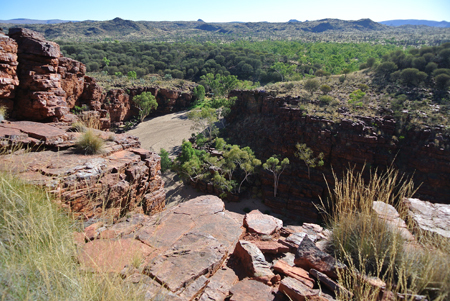 Thank goodness you can still get away from the weeds and the bollards: the view from the rim walk is stupendous. Not much to see. Just a bit of scrub. We recently tried to do one of the walks at Simpson’s Gap and didn’t get very far: All totally overgrown with grasses – not many native ones, unfortunately. We’ve been saying those things to the rangers (on the rare occasions you actually see one in a park unless it’s a scheduled talk) for many years and many times, but unfortunately too much money seems to be spent on sitting in the office and not enough outside really protecting our beautiful nature! Why? I do not know and will never understand! It’s a real shame. There would be so many ways of doing at least something! “From little things, big things grow.” This goes in a negative and positive way. If you leave one seed, there will be hundreds after the next rains, but, if you pull or dig out that one invasive plant – there will be less. Instant success! 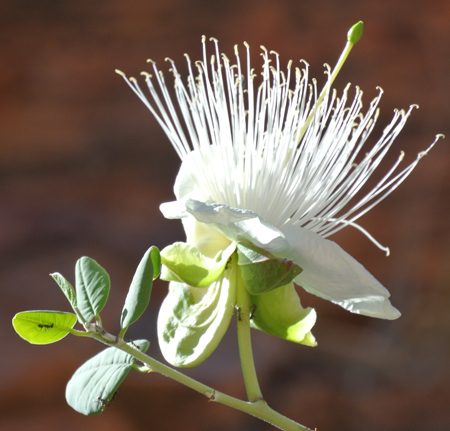 I used to pull out onion weed in the FLinders Ranges wherever I saw it – every little step helps. If everyone would help, we could do big things. Maybe do more public info work and get community groups, schools and even prisoners to help. Let’s get started – all together as a community. PS: Same thing with feral cats. I am so sick of always just hearing there are too many … why not start though, and get rid of every single one you see!? Actually Erwin, Parks – like every government department – seems to be spending more time controlling its own people these days than allowing them to actually do what many would consider to be their job. It’s hard to spray weeds out bush when you are having meetings to talk about how busy you are back in town. Then there are all those glossy motherhood statements to spend most of the year – and most of the budget – preparing. But what would I know? I am so stupid I believe national parks are all about protecting pristine environments and native things. Perhaps they can change their on-hold music to Big Yellow Taxi.